It's that time again, e-tailwebstores has a new competition & of course I am entering! 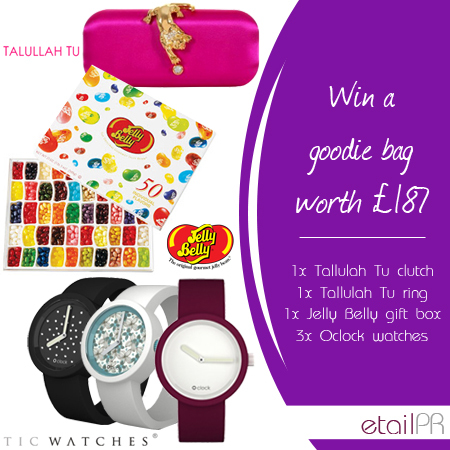 This week (till March 1st) they are giving away 1 x Tallulah Tu clutch bag, 1x Tallulah Tu ring, 1x Jelly Belly gift box 3 x Oclock watches from Tic Watches. Check out their blog for all the details. You don't have to be a blogger or signed up to our blogger network to win the goodie bag so make sure you enter! I LOVE LOVE LOVE Jelly Belly, I even got my mum 800g of Jelly Belly sweets for Christmas and ended up stealing about 100gs of them. I think the Tallulah Tu clutch is so cute. As you may already know I am a massive pink addict. I'd have pink everything if I could. I love the watches too. Very stylish!! I have my fingers crossed with this one. The more I look at the clutch the more I fall in love haha. The competition is open internationally and will end next Friday 1st March.